Marketplaces and prices shown matched UPC number 010343920309 during our search. Get organized in a snap - scan up to 35 ppm/70 ipm1; Single-Step Technology captures both sides in one passEasily scan stacks of paper - robust 50-page Auto Document Feeder; scan business/ID cards, receipts and morePowerful software included - easy scanning with intuitive Epson ScanSmart Software2; preview, email, upload and more; automatic file naming and object recognition save timeCompatible with most software - the included TWAIN driver allows for easy connection to most document management softwareBuilt-in Nuance Optical Character Recognition (OCR) - create searchable PDFs and editable Word and Excel filesEasy sharing and collaboration - email or upload to popular cloud storage services2 such as Dropbox, Evernote, Google DriveIntelligent color and image adjustments - auto crop, blank page and background removal with Epson Image Processing TechnologyReliable paper feeding system - Ultrasonic Double Feed Detection prevents missing pages; also features Dynamic Skew CorrectionOptional Network Interface Unit available3 - share the scanner across your network (unit sold separately)Eco Features ENERGY STAR qualified RoHS compliant Recyclable product4 Epson America, Inc. is a SmartWaySM Transport Partner5 Better Products for Better Future For more information on Epson's environmental programs, go to www.epson.com/environment. 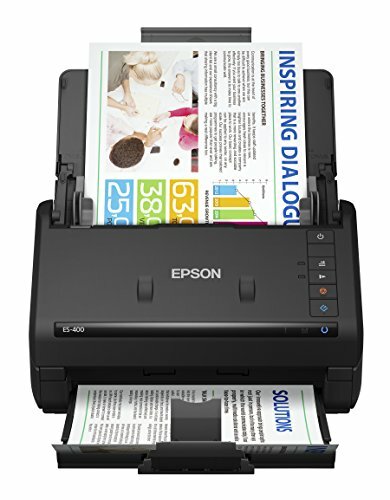 Epson WorkForce ES-400 Duplex Document Scanner. Scan documents in a snap with this color scanner. 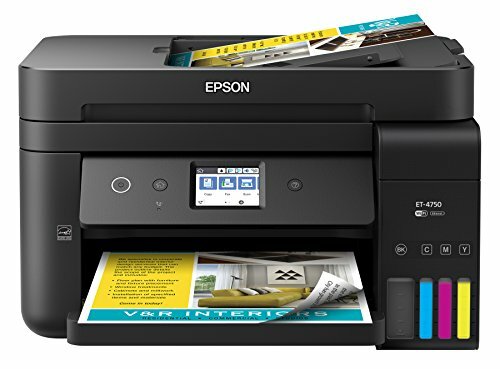 Designed to hold up to 50 pages at once, this scanner offers reliable Single-Step technology that captures both sides of each page in a single pass. Up to 300 dpi optical resolution for crisp text and images. Up to 600 dpi hardware and up to 1200 dpi interpolated resolutions. 30-bit input and 24-bit output color/grayscale depth. Scans up to a maximum size of 8.5in. x 240in. and a minimum of 2in. x 2in. to accommodate documents large and small. Scans up to 35 ppm for quick project management. Single-Step technology captures both sides in just one pass to cut down on processing time, and Ultrasonic Double Feed Detection guards against missed pages. 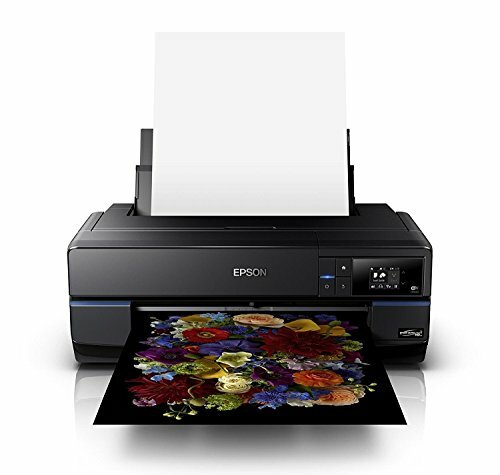 Epson(R) Image Processing technology offers a variety of intelligent color and image adjustments. Includes auto crop, blank page and background removal to help ensure documents come out just how you like. Double feed detect skip, slow scan mode, scan and stop buttons enable easy control. Send documents to the Cloud for easy access. Intuitively scans to Dropbox, SharePoint, Google(TM) Drive, Evernote and more. USB 3.0 interface offers a high-speed connection. USB cable, AC adapter and power cable included. Create documents that can be edited in Microsoft(R) Word(R) or Excel(R). Includes OCR software and the TWAIN driver is compatible with a variety of other document management software. Backed by the manufacturer's 1-year limited warranty. 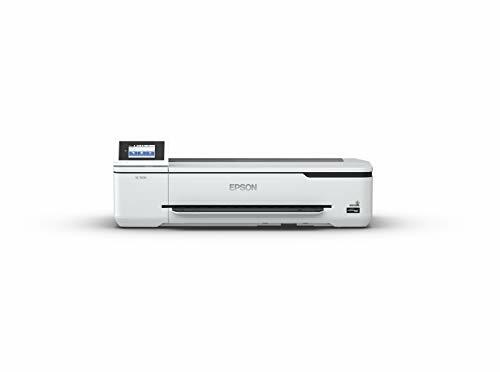 Epson(R) WorkForce Color Duplex Document Scanner, ES-400 is one of many Scanners available through Office Depot. Made by Epson.